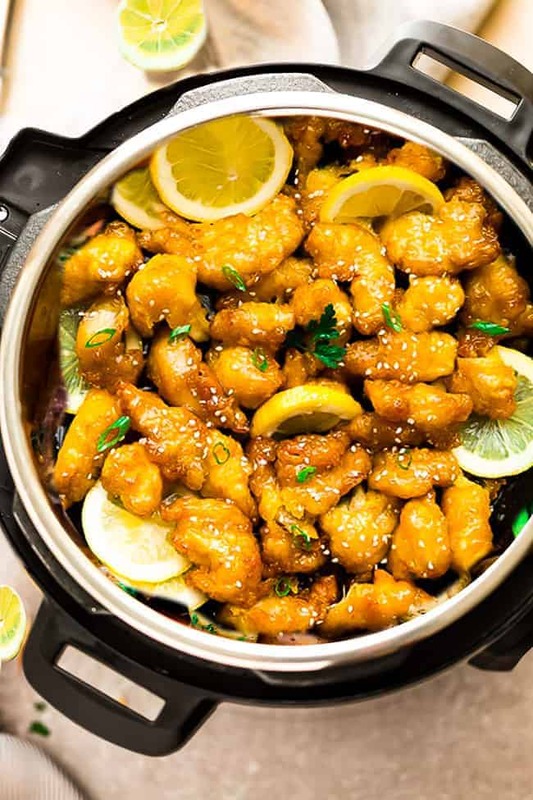 Instant Pot Chinese Lemon Chicken – an easy homemade pressure cooker recipe of the classic Asian Takeout-Style Lemon Chicken. 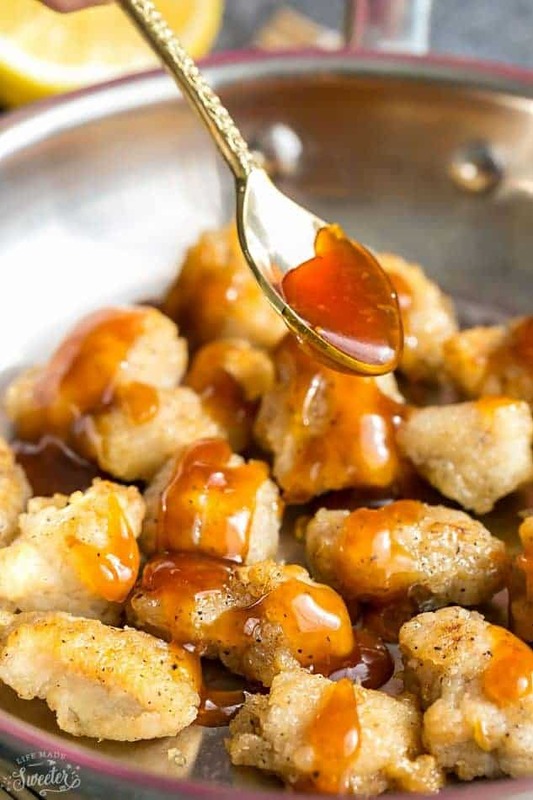 This healthier low carb / keto version of the popular favorite has a light and crispy coating covered in a flavorful sweet, savory and tangy lemon sauce. 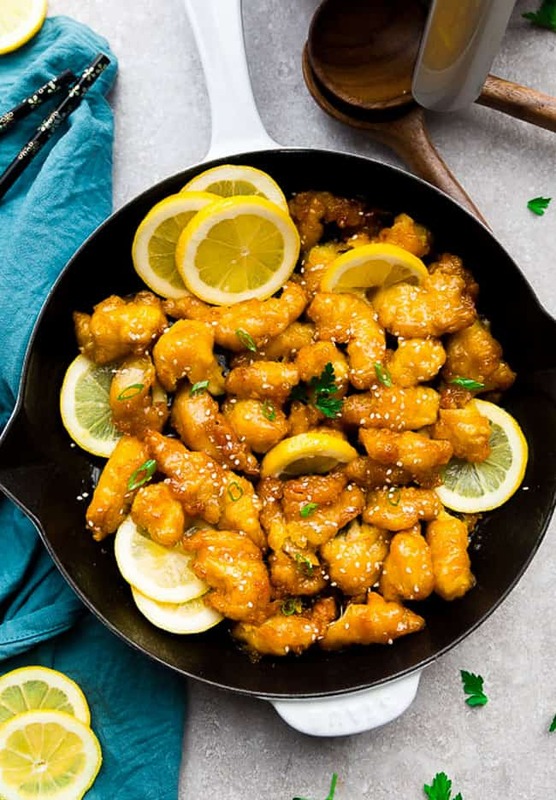 Lemon Chicken is is a popular sweet and tangy deep-fried chicken dish that is served in North American Chinese restaurants. 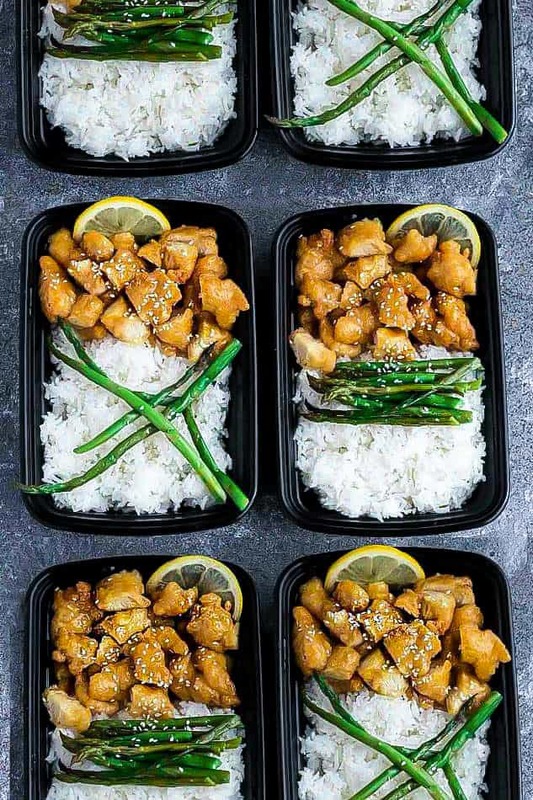 My son absolutely loves anything lemon and Chinese Lemon Chicken happens to be one of his favorite takeout dishes. We prefer making Chinese takeout food at home because we have more control of what’s going into it. 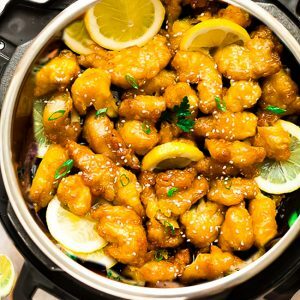 This Instant Pot Chinese Lemon Chicken is based off our popular Asian Lemon Chicken. I’ve adapted the ingredients and method to include instructions for the Instant Pot instead. The deliciously addicting sauce for this Chinese Lemon Chicken is what makes this dish even better than takeout. It’s got the right balance of sweet, savory and zingy and is full of dimension and flavor. Plus, this healthier and sugar free version also happens to be low carb, gluten free, keto and paleo friendly. And the best part? Clean-up is a breeze since there’s no deep frying involved. We make this dish so often that now it usually takes us about 10 minutes to prep and can be on the dinner table in 30 minutes. A quick and healthy supper that’s perfect for busy weeknights. MAKE THE SAUCE: You’re going to start whisking the sauce ingredients together in a medium bowl. Cut the chicken in chunks or strips and combine with an egg white and 3 tablespoons of the sauce. COAT THE CHICKEN: In a large zip-top freezer bag, combine the almond meal, pork rinds, salt, and black pepper. Add the chicken and shake well to coat. Feel free to use corn starch and panko crumbs if you are not low carb or paleo. LIGHTLY SAUTE IN THE INSTANT POT: Turn your Instant Pot to SAUTE then add in oil. Once oil is hot, add the chicken and cook for 1-2 minutes, until a brown coating appears (chicken will not be cooked through which is fine). You may have to work in batches. PRESSURE COOK: Once you’ve browned all the chicken, place back in the Instant Pot and pour in the remaining sauce along with 1/3 cup water (or chicken broth). Cover with lid. Press the valve to SEALING and press MANUAL or PRESSURE COOK for 4 minutes. The Instant Pot will take some time to come to pressure. Once the 4 minutes is up, use a long spoon and push the valve to VENTING for a QUICK RELEASE. Once all the pressure is released, carefully unlock the lid. Press the SAUTE button, then whisk the arrowroot starch (or xanthum gum) with 2 tablespoons water until combined and stir into the Instant Pot. Allow sauce to cook until it bubbles and thicken. Taste and adjust seasonings to what you prefer – add additional lemon for tangier, more sweetener for sweeter and sriracha for spicier, if desired. Pack with your favorite low carb side – cauliflower rice, spiralized zoodles or if you’re not keto or low carb, you can pack them with Jasmine or brown rice. Combine the sauce ingredients together in a medium bowl. Measure out 3 tablespoons and add to a large mixing bowl. Set aside the saucepan. To the mixing bowl, lightly beat in the egg white and add chicken pieces. Mix well. In a large zip-top freezer bag, combine the almond meal, pork rinds, salt, and black pepper. Add the chicken and shake well to coat. Turn your Instant Pot to SAUTE then add in oil. Once oil is hot, add the chicken and cook for 1-2 minutes, until a brown coating appears (chicken will not be cooked through which is fine). You may have to work in batches. Once you've browned all the chicken, place back in the Instant Pot and pour in the remaining sauce along with 1/3 cup water (or chicken broth). Cover with lid. Taste and adjust seasonings to what you prefer - add additional lemon for tangier, more sweetener for sweeter and sriracha for spicier, if desired.